The 224th Electrochemical Society ECS Meeting was held in the heart of San Francisco, at the meeting headquarters hotel, the Hilton San Francisco (333 O’Farrell Street, San Francisco, CA 94102). ECS bridges the gaps among academia, research, and engineering—bringing together scientists from around the world for the exchange of technical information. This unique blend provides an unparalleled forum for the integration of these areas of science and technology. 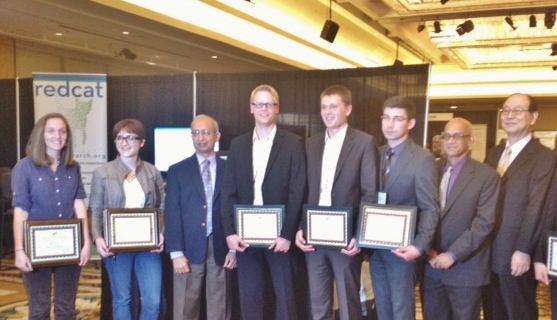 This major international conference at the Hilton San Francisco included more than 50 topical symposia consisting of over 2,800 technical presentations, and feature the third international ECS Electrochemical Energy Summit (E2S), which is fast becoming a tradition at ECS meetings. 2S and ECS Short Courses help launch the meeting on Sunday, October 27. Two days of special events were devoted to E2S, with a featured symposium that explored the energy– water nexus, the intersection of two critical resource issues. Events on Sunday included an afternoon program with three invited speakers, all experts in energy issues, along with a dynamic Energy Research Group Showcase, a Poster Session, and a reception. 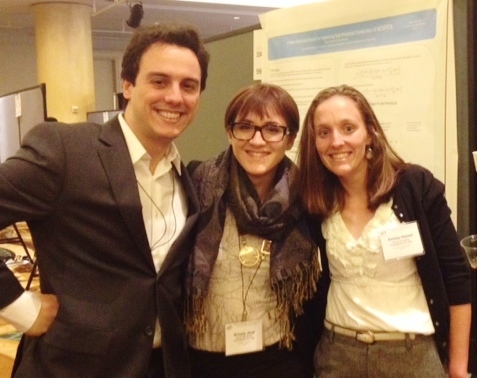 E2S events on Monday were devoted to the Energy–Water Nexus Symposium (A3), and The ECS Lecture. Also at the conference was held Technical Exhibit and General Society and Poster Sessions. 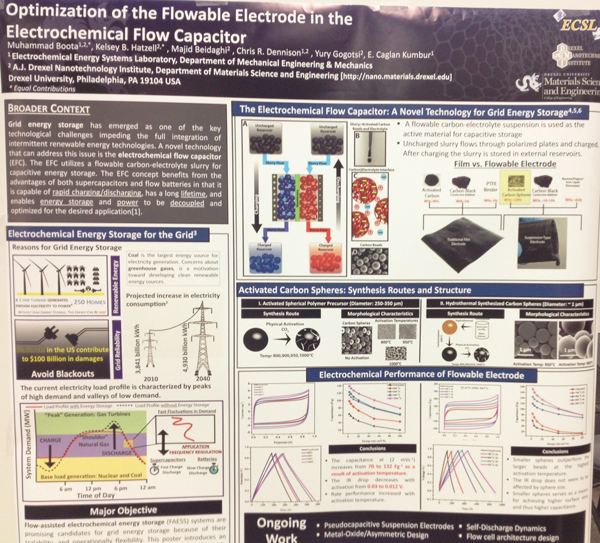 On Monday, October 28, graduate research assistant from Nanomaterials group of Drexel University, Kelsey B. Hatzell, have presented at Poster Session presentation on Methods for Enhancing the Flowable Electrode Capacitance in the Electrochemical Flow Capacitor, resulting by common work of Drexel research team - Majid Beidaghi, Muhammed Boota, Christopher R Dennison, Emin Caglan Kumbur and professor Yury Gogotsi. Grid energy storage has emerged as one of the key challenges limiting grid resiliency and impeding the full integration of intermittent renewable energy technologies. A novel technology that can address this issue is the electrochemical flow capacitor (EFC). The primary difference between traditional supercapacitors and the EFC is that the EFC utilizes a flowable electrode for capacitive energy storage. The electrostatic nature of this charge storage mechanism allows for fast charging and discharging, which allows the EFC to be tailored to specific grid applications such as voltage and frequency regulation where short response times are needed. Researchers have investigated the effects of pore size distribution and ammonization of the carbon surface as possible methods to increase the capacitance of the active material in the flowable electrode. 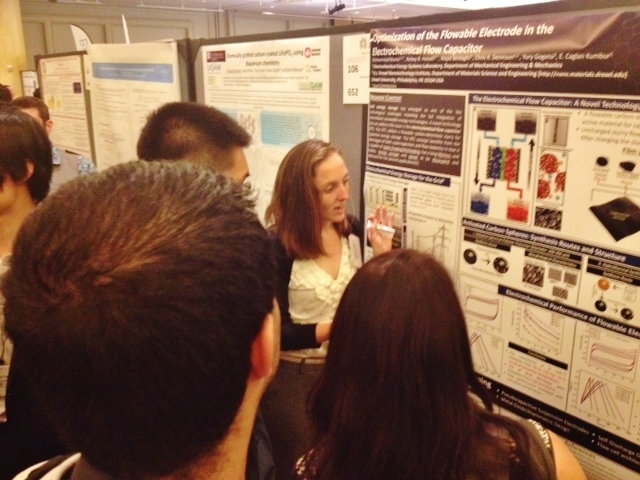 On Wednesday, October 30, 2013 Kelsey B. Hatzell, graduate research assistant from Nanomaterials group, Drexel University, made a report on High Electrosorption Capacity Electrodes for Capacitive Deionization at the Energy–Water Nexus Symposium (A3) of ECS Electrochemical Energy Summit, at 224th ECS Meeting. In water stressed regions across the globe, the rate of abstraction from deep aquifers often exceeds the rate of recharge. This leads to water shortages that are sometimes irreversible. In order to address these water shortages, researchers are looking to the most abundant of source water present on earth, seawater. However, to transform seawater into clean drinking water requires a range of energy intensive processes. Such processes include Reverse Osmosis, UV disinfection and Thermal Distillation. The most promising of these technologies is Reverse Osmosis, which can achieve 1.8 kWh/m3 in current commercial plants . Nevertheless, this technology is fundamentally hindered by membrane fouling and slow water transport . Thus, there has been a movement toward technologies that do not use membranes, and toward technologies that remove the minority component (salt) rather than the majority component (water) . Capacitive Deionization (CDI) is the process of removing ions from brackish/seawater by applying a potential between two electrodes, adsorbing ion on the surface, and producing clean water. Carbon materials are favorable as electrode materials in CDI systems because they exhibit high electric conductivity (~100 S m-1), specific surface area (up to 2000 m2 g-1), and high electrochemical stability. Herein, we report the use of spherical activated carbon beads (BET SSA 1219 m2 g-1) as the active material for electrodes for a capacitive deionization system. In a 0.15 M solution of NaCl at 10 mV s-1 the electrodes demonstrate a capacitance of 58 F/g which is on par with recently reported electrode capacitances. These results indicate that with further optimization, the spherical geometry of the particles may yield enhanced electrosorption capacity for CDI. 1. Elimelech, M.; Phillip, W.A. The Future of seawater desalination: Energy, technology, and the environment. Science 2011, 333-712-717. 2. Wang, Evelyn and Karnik, Rohit. Graphene Cleans up water. Nature Nanotechnology, 2012. 3. Porada, S., Weinstein, L., Dash, R., Van Der Wal, A., Bryjak, M., Gogotsi, Y., & Biesheuvel, P. M. Water desalination using capacitive deionization with microporous carbon electrodes. ACS Applied Materials & Interfaces, 4(3), 1194-1199, 2012.